If Jesus is the Messiah, Why Don’t More Jewish People Believe in Him? Christians claim that Jesus is the Messiah as predicted by the Old Testament. Most Jews reject Jesus as their Messiah. Therefore, Jesus cannot be the Messiah. There are two major problems with this line of reasoning. First, this is an appeal to popularity. Not long ago, people believed that the earth was flat. Just because a belief is widely held doesn’t make it a correct belief. The popular opinion of the Jewish people could be wrong. Secondly, this is a wild overstatement. 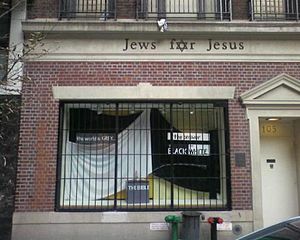 Many Jews do accept Jesus as the Messiah. At the earliest point of the history of the church, only Jews were Jesus’ followers. There are congregations of Jewish Christians across the globe today, including many in Israel. Furthermore, Jesus himself predicted that he would be rejected by most Jews of his era. He was not at all what many Jews expected of the Messiah, and little has changed to this day. Their understanding of the Messiah was that he would be someone who would overthrow Israel’s oppressors and usher in world peace, not be crucified on the cross like a criminal. To hang on a tree, in their view, is to be cursed by God. (see Deuteronomy 21:23) However, in Mark 12 Jesus predicted he, like so many of God’s prophets sent to the nation before him, would be rejected, mistreated and killed. History also tells us that the Romans destroyed Jerusalem in 70 A.D.; and the Jews, sadly, became dispersed across the world. Only in the past century have they been gathered as a nation again. Jesus not only predicted his rejection in this parable, but also the destruction that followed in 70 A.D. (see also Matthew 22:1-14, Mt. 24) Note that this does not make the church “special” any more than Jews are special because of their ethnicity. Paul warns us that just as judgment came to Israel for their rejection, so we too can be judged for our unbelief. He goes on to say that God’s gifts toward Israel and their calling is without repentance. (See Romans 11) God “so loved the world”, which includes people of all nations, including the Jews through whom the Messiah came. So the argument raised by the skeptic is demonstrably fallacious and furthermore disproved by history. It does nothing invalidate the claims of Christianity, if anything these objections can be used to strengthen Christianity’s claims.